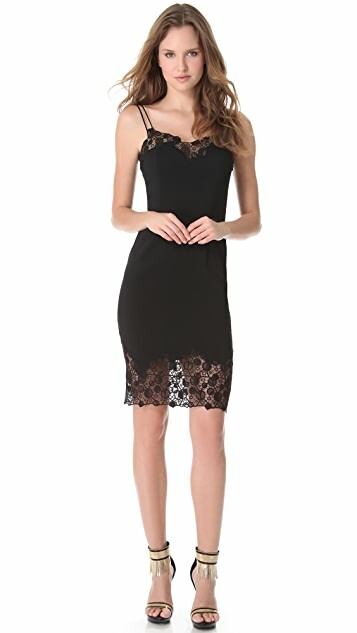 Sheer, scalloped lace edges bring a seductive element to this elegant cocktail dress from Versace. Slender double straps skim the shoulders, and a hidden zip closes the side. Silk lining. Fabric: Smooth, slinky weave / lace. In 1978, Gianni Versace created a design house that merged high fashion with art, celebrity, and theater. Today, the label known for its streamlined, goddess-worthy silhouettes and sensual expression remains one of the world's most recognized luxury brands. Under the creative direction of Donatella Versace, the house continues to design and produce haute couture, womenswear, menswear, jewelry, and home interiors, all while staying true to the original aesthetic that imbues each Versace creation.